This is the latest in our series of jazz releases from the archive of the Ackerman collection comprising previously unreleased recordings, mainly of ‘live’ material. 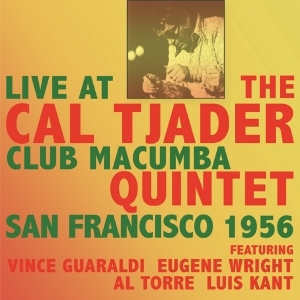 It comprises two ‘live’ club performances by the Cal Tjader Quintet, recorded at the Club Macumba in either September or October 1956. It comprises a fascinating line-up of the quintet, including the great Luis Kant on congas, along with an unnamed bongo player. Although the recording quality is excellent, the atmosphere is completely informal and somewhat unstructured, giving a fascinating insight into a fairly experimental band developing and exploring their material. As would be expected, the music is entirely Latin and mambo-based, including versions of jazz standards (including Lullaby of Birdland, written by Tjader’s former boss, and explorer of Latin rhythms, George Shearing) alongside mambo originals by the likes of Tito Puente. A couple of tunes are repeated in the two performances – not surprising for a band doing club dates – which provides very interesting musical comparisons , given the substantial amount of improvisation involved. This is an important and much-anticipated release, which will add a significant strand to the already substantial canon of Tjader’s innovative work in the Latin Jazz genre during the ‘50s.